Every Wednesday night of the year, sailors meet at Coopers Alley L-Head and participate in Wednesday Night Regatta. 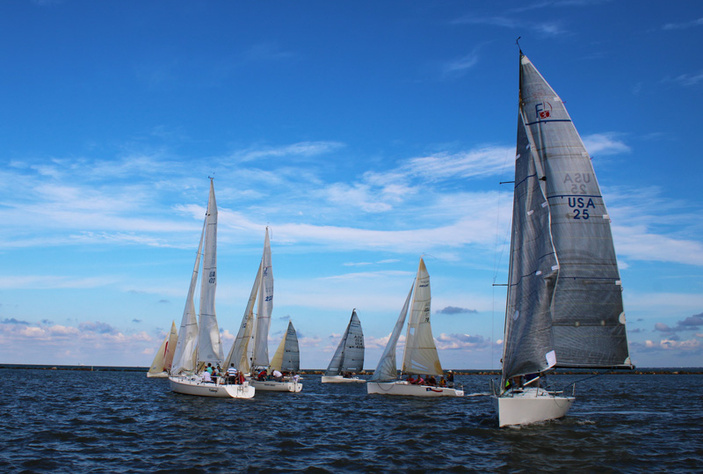 These evening social regattas have been going on for years, for good reason: the race starts at 6 p.m., so sailers and onlookers get fantastic views of the sun setting over Corpus Christi Bay. Dave Fuertes is a member of the Corpus Christi Midget Racing Fleet (CCMORF), the friendly organization that puts the weekly event together. Fuertes has been doing the Wednesday Night Regatta since 1995. He was brought into it when he met a guy at a bar and was invited out on his boat. Watch the race from the shore at the starting line on Lawrence Street T-Head. Bleachers fill with onlookers when the weather is nice. The race usually comes to a close at 7:30 p.m. If you would like to be a part of the race, there is plenty of space to hop on a boat as a crew member. The members of the CCMORF always welcome new sailors onboard. To get on a boat, try hitchhiking at the marina for a ride the day of, or send a message on the Facebook page to get in touch with a sailor in advance.